Published today, issue 90 of the inspiring current affairs magazine traces how ideas about what it is to be a man are changing – and why this is a good thing. The cover story looks at the unique difficulties facing guys and how mental health statistics in particular show that many men are suffering. But as ideas about male identity evolve, men are helping each other to thrive. From celebrities sharing their emotional vulnerability, to the mentors supporting young men who have been in the criminal justice system – Positive News speaks to those who are breaking down stereotypes and rebuilding brotherhood. Finley’s TED talk about growing food on the streets of Los Angeles has been viewed almost 3m times, while a sign in his garden reads ‘Real Gs grow food’. As Finley explains, he considers being a man to be about “being a conscious citizen of this planet”. Care about how the media shapes your world? We believe that excessive negativity in the press is destructive for society, so we’re working to create a more constructive and compassionate media. But to do that, we need your support. Become a Positive News member and help us to change the news for good. Editor-in-chief Sean Dagan Wood said: “Tragically, suicide is the biggest killer of men under 45 in the UK. At the same time, we’ve been picking up on inspiring projects supporting men, and hearing a growing conversation about rethinking what it is to be a man. Positive News magazine offers quality, independent journalism that focuses on progress and possibility. 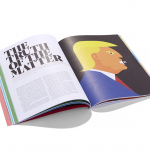 Other key articles in the new issue report on the global fightback against fake news; the surprising science behind why we love emojis; what’s driving the renewable energy revolution; and how tattoos are helping heal the trauma of domestic abuse in Russia. The new issue also includes an interview with Lori Lakin Hutcherson who founded the US-based website Good Black News to fill what she saw as a cultural void of positive stories about people of colour. Meanwhile, author Richard Louv writes in the magazine about why “we must have the courage to be idealistic again” when it comes to our relationship with nature; and we travel to San Francisco to explore peace, love and big tech, 50 years on from the original summer of love. The issue also includes a feature about the mass participation sports that are urging even the most dedicated coach potatoes to become active; a look at the projects helping make renting fairer and more affordable; and it casts an eye over potential solutions to ocean plastics. Plus, the magazine’s news section tracks positive developments across the world, from the opening of the UK’s new Migration Museum, to a reduction in shootings in New York City. “From the terrorist attacks in London and Manchester, to the US withdrawing from the Paris climate agreement, there has been a lot of tragic news in recent months,” Wood added. Become a Positive News subscriber to receive our intelligent, inspiring and beautifully designed magazine each quarter. Join us in changing the news for good.